Hiya, folks! Brent here and today I’m reviewing another bike from M2S. This one is the All Terrain Ultra, but I’ve also covered the All Terrain R750, which you can see here. This bike is similar to the R750, but with a few key differences that really makes it stand out. 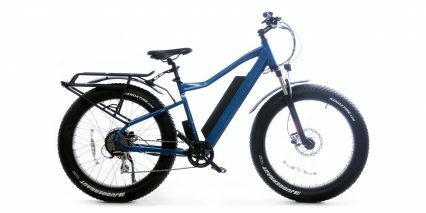 First and foremost, the Ultra has a powerful 750 watt mid-drive motor that can propel this hefty 75 pound monster to a top speed of 28 mph. 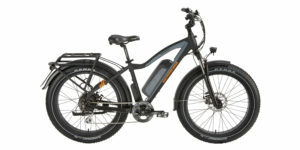 It also has full suspension which makes for a pretty cushy ride. 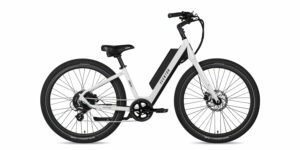 The Ultra starts runs for $2,950, which is definitely out of the affordable, entry-level range and into the mid-level range for electric bikes. 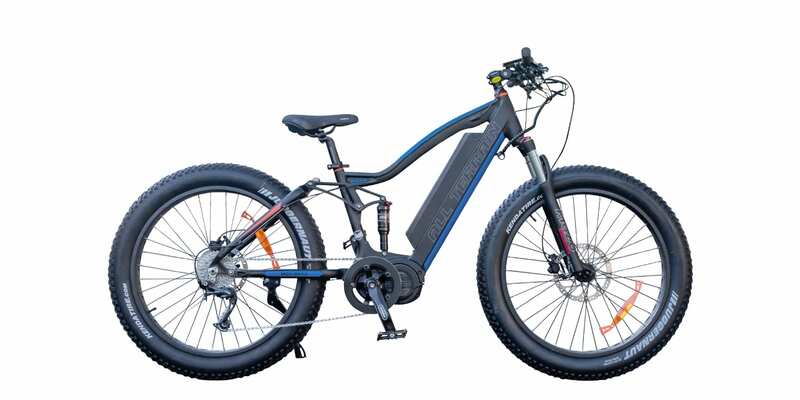 The Ultra is geared for high speed and off-road use, with that powerful mid-drive motor which leverages its power against the gears, the full suspension setup and the huge four inch fat tires. 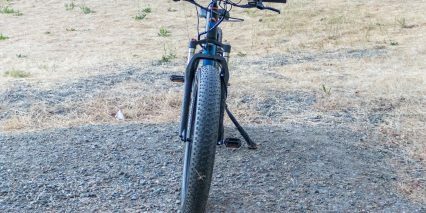 There’s a few other reasons that lead me to believe this bike is built for the trails, including the fact there are no fender bosses (well technically there is one on the forks but no bosses on the rear), bottle cage bosses or rack bosses, it has a double sided aluminum chain guard that acts as a bash guard, hydraulic brakes with a massive 203 mm rotor in the front and 180 mm rotor in the rear and a pretty nice Shimano Alivio derailleur. 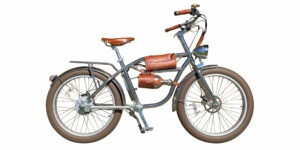 Thankfully, the Ultra does come in two different frame sizes and colors — medium and large and black and blue, respectively — though the options for this bike aren’t as extensive as the options for the R750, which has four different frame sizes, two different frame styles and five different colors. 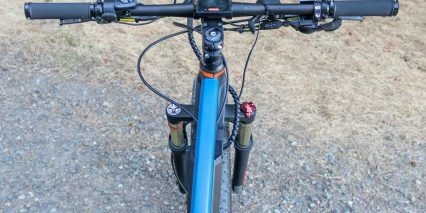 Still, there are a few different options to choose from with the Ultra to help accommodate riders of different heights and reaches, including an adjustable reach stem, which is nice. 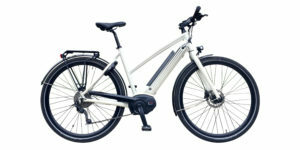 M2S is a direct-order only company and they only deliver to the United States, so those in other countries won’t have access to these bikes from the company. In my experience, there’s one huge pro and a handful of potential cons when it comes to direct-order only. The biggest pro is going to be the price point, which generally speaking is considerably lower than brick-and-mortar shops. But there’s also a few downsides, principally the fact the bikes have to be assembled by the customer. This can be tricky in some instances, and in some cases I’ve had some serious trouble getting everything to fit right. However, the bikes I’ve unboxed and assembled from M2S have been a breeze, taking no more than 15 minutes, with the only assembly points being the front wheel and the handlebars… everything else is already taken care of, which is awesome. Direct-order companies can also be difficult to communicate with. In many instances I’ve experienced sub-par customer service and a language barrier that makes getting questions answered somewhat difficult. Again, with M2S, that’s not an issue at all. I’ve made a few calls to M2S from a few different phone numbers and had an actual live human being pick up the phone on the other end. The folks over at M2S are not only friendly and easy to talk to, they’re also quite knowledgeable about their products. Hooray! The last potential pitfall of direct-order only is the potential for the bikes to get damaged during transit. This generally isn’t a result of poor packaging from the companies, but rough handling from the couriers. In the case of the Ultra, the arch of the fork was snapped and I had to have the company send me a replacement. They were quick to get the replacement out to me and once that was swapped out everything was fine. Overall, my experience with unpacking and assembling the Ultra was positive, despite the damaged fork snafu. Alright! Onward and upward to the specs. 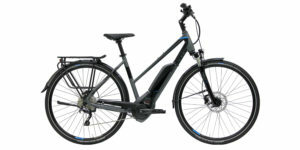 Driving the Ultra to a top pedal assist or throttle only speed of 28 mph (the top speed can also be raised and lowered in the display settings) is a powerful Bafang mid-drive motor with 750 watts of nominal power and a whopping 160 Newton meters of torque. 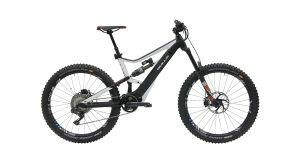 This power and top speed is awesome for trails where it’s allowed, but because this bike is a class 3 out of the box, it’s going to be illegal to ride in many instances. I advise checking with state and local laws before heading out to the open road since not only can this power and speed be dangerous, it can also result in legal troubles in the case of an accident, which is the last thing I’d want for anyone! The mid-drive motor is great for a lot of reasons. 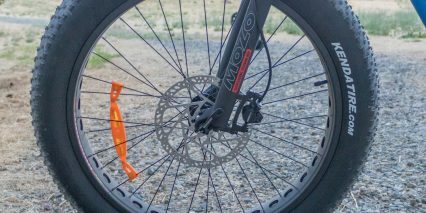 It’s placement low and center on the frame makes the Ultra quite well balanced, keeping the center of gravity low. It also leverages the gearing, so when I’m in first gear the motor is going to have more torque but less top speed than compared to when I’m ninth gear. 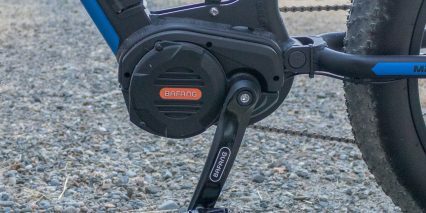 But mid-drive motors can place a lot of strain on the components for this very reason, so I try to ease off the gas and pedaling whenever I switch gears. Still, the Ultra does have shift detection, which cuts power to the motor whenever I switch gears, and the shift detection seems to get the timing right about 80 percent of the time. 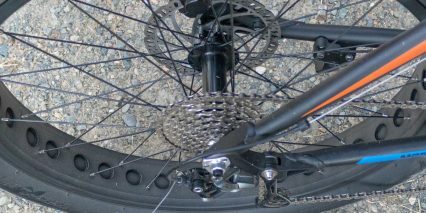 This helps to prevent mashing of the gears from the transfer of torque from the motor to the derailleur. 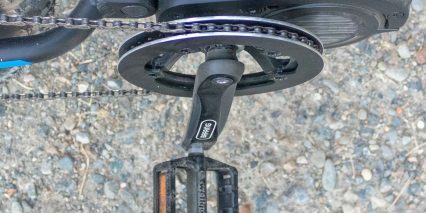 The chainring also has a narrow-wide tooth pattern to help keep the chain locked into place, as well as a double-sided aluminum bash guard, which not only helps keep the chain from popping off but also protects the teeth in the event of a strike. 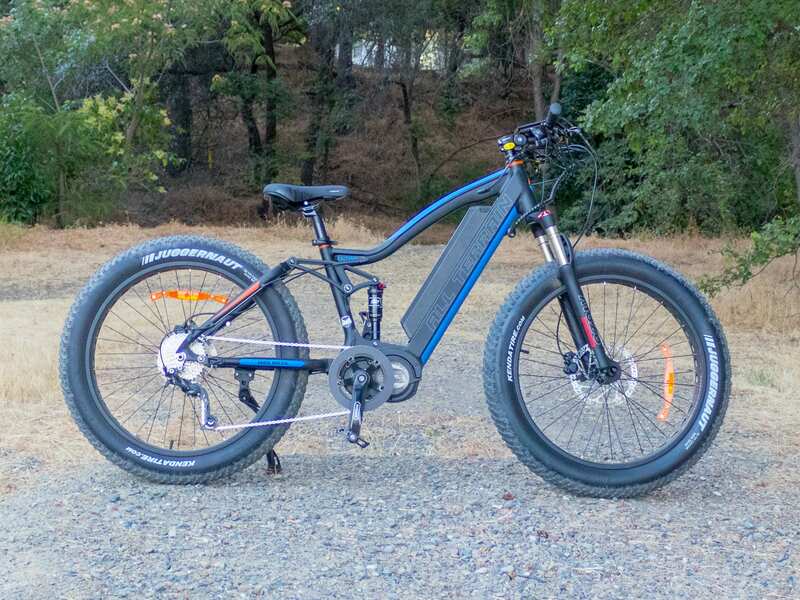 Now, because the Ultra has massive four-inch tires and weighs in at an electric bike heavy-weight-title-worthy 75 pounds, a lot of that torque and power from the motor feels like it’s being lost. 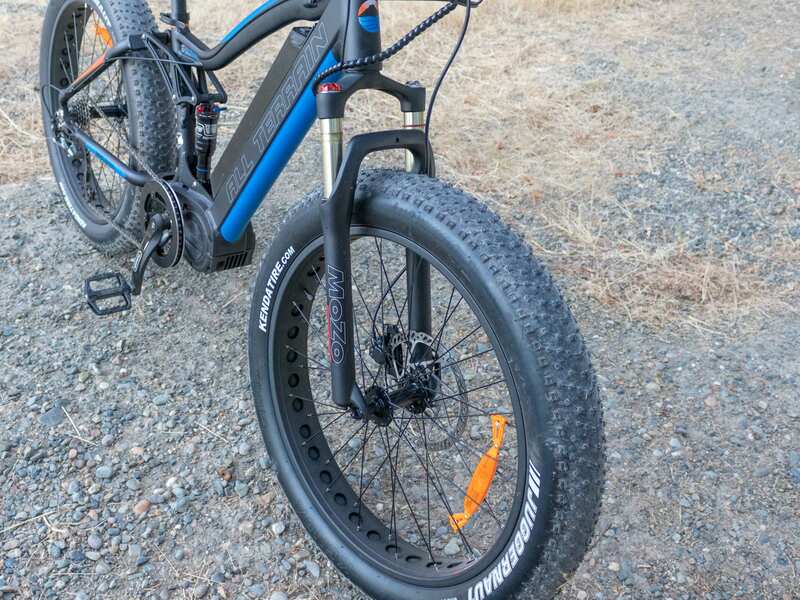 That extra wide tire patch and weight from the full suspension takes its toll and off the line the Ultra feels sluggish, despite the impressive specs. While I did my max speed and power tests in lower gears and in Sport Mode, I do weigh about 190 pounds, which might be heavier than a lot of riders. So, naturally, lighter riders might find this bike feels more powerful. 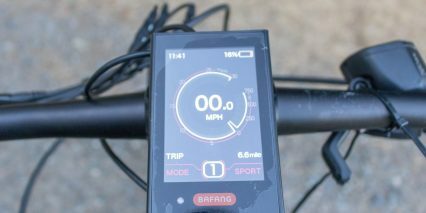 But even with the sluggish off-the-line power, the Ultra was able to eventually get me up to around 28 mph on flat ground with a little pedaling assistance. 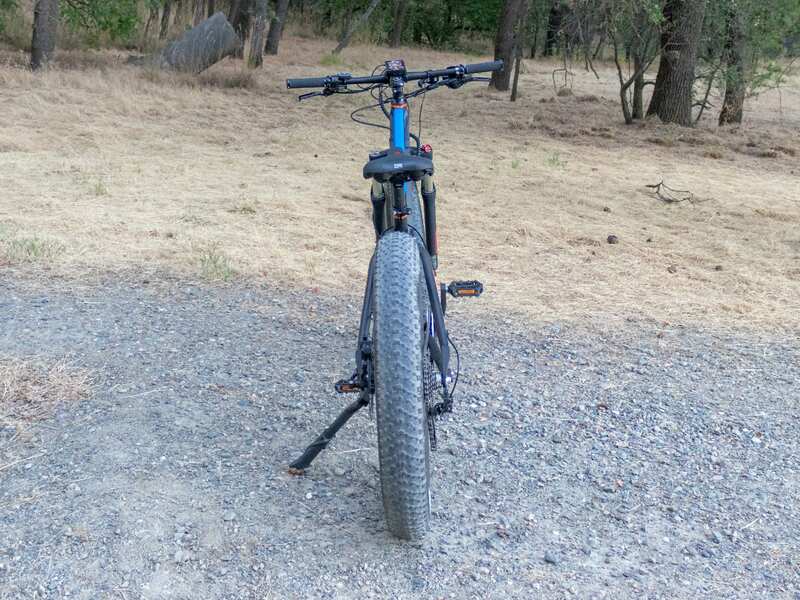 And with the fat tires and wide 710 mm handlebars, it does feel pretty stable. In fact, I noticed the Ultra doesn’t particularly like to turn, and I think that’s due to the centrifugal force of the heavy wheels fighting to keep it perfectly upright. Pedaling at high speeds is great though thanks to the 44 tooth chainring and 11-34 tooth cassette. Even at 28 mph I was able to keep a comfortable cadence. And since the Ultra has an advanced sensor that measure wheel speed, cadence and torque, the motor activation and shutoff is lightning fast. 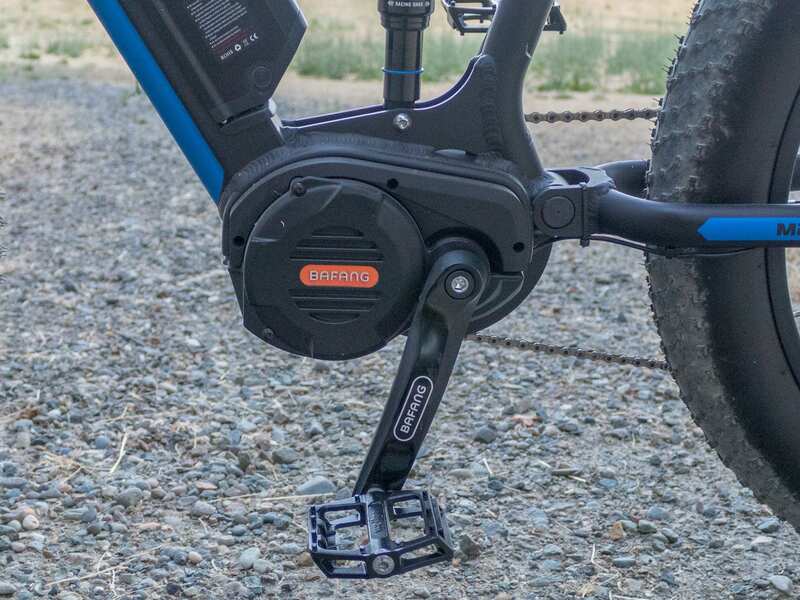 With these high speeds comes the need to stop just as quickly, and the dual piston hydraulic brakes with the 203 mm rotor in the front and 180 mm rotor in the rear provide all the stopping power I could want, especially with the extra wide tire patch. The motor inhibitors are a nice bonus as well, which cut power to the motor whenever the brake levers are depressed, ensuring the shortest possible stopping distance. 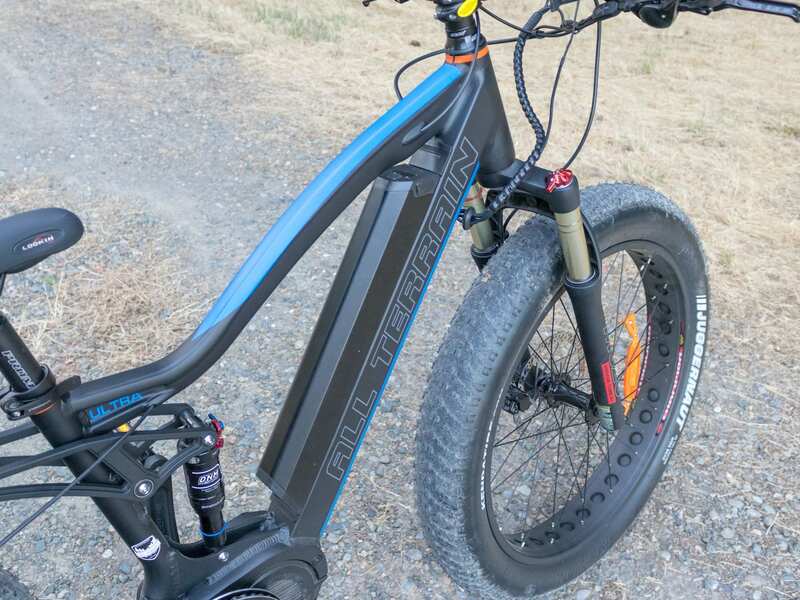 Powering the Ultra, the headlight and the display is a 48 volt 696 watt hour locking, removable Lithium-ion battery that’s semi-integrated into the downtube. The key port is located at the top, which keeps it clear of the cranks and free from being potentially damaged, but the charging port is located at the bottom and there is a real possibility of it getting accidentally snagged if the cranks are rotated while charging. 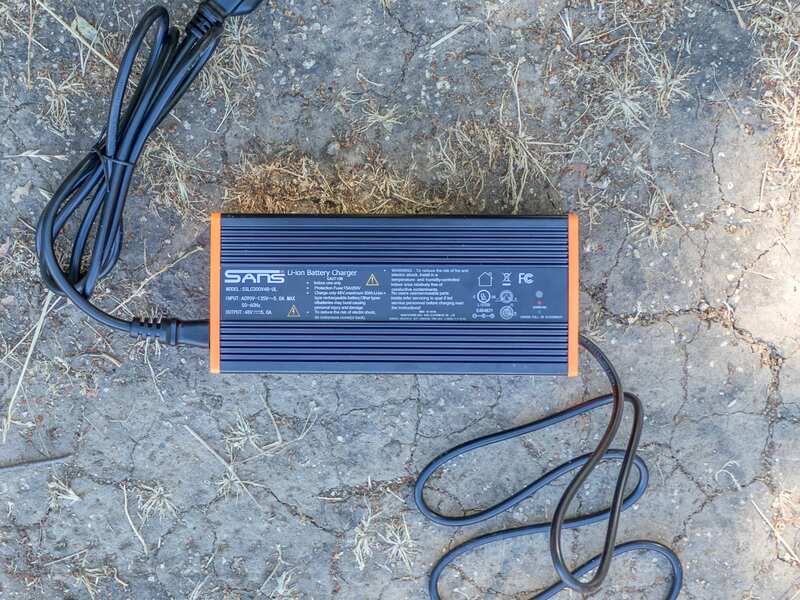 For this reason, I suggest charging the battery off the bike, or just being mindful of the charging port if the battery is still in the downtube. 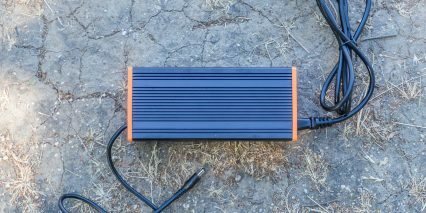 With a total of 696 watt hours, this battery is above average in regards to capacity, but I noticed it was rapidly draining while I was riding full bore. With great power comes great responsibility… errr… battery drain I mean. 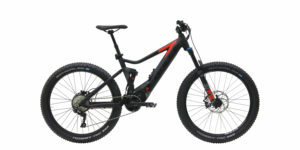 The range for the Ultra will likely be similar to the range of the R750 given their similar specs, and while I estimate the range to be somewhere between 20 and 60 miles it will of course largely depend on how the bike is ridden, terrain and rider weight. The cool thing is the display will estimate the remaining range for me, which I’ll talk more about here shortly. Also on the battery is a full size USB Type A port for charing accessories while riding or while on the go. This is a small feature but is actually pretty important for me since I have so many gadgets on hand. It’s great to have the option to charge up my phone a bit if I need to. I really dig the Bafang display on the Ultra. 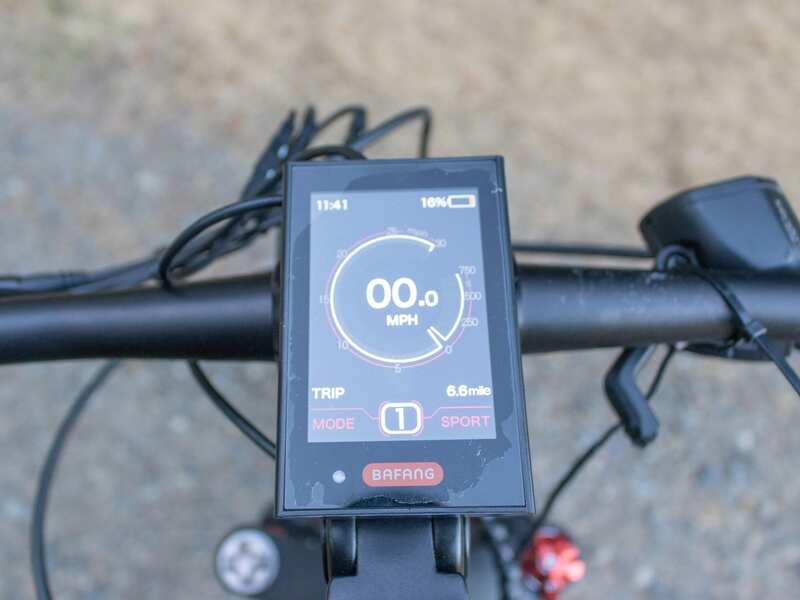 It’s an LCD display with some color splashed in there and it has a nice layout that shows a percentage battery Indicator, a clock, speed, max speed, average speed, odometer, tripometer, range, calories, trip timer and pedal assist level. 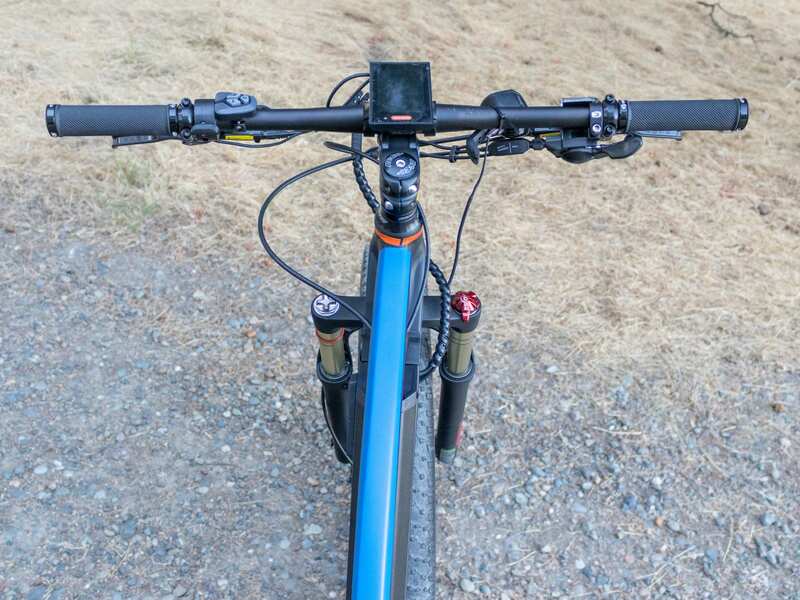 There another full size USB Type A port on the bottom of the display as well, providing even more options to power accessories while riding. My only real grip with this display is that it isn’t adjustable or removable without tools, unless I leave it somewhat loose so I can spin it around on the handlebars. This means I can’t angle it to reduce glare and I can’t take it off when I leave it at a public bike rack, leaving it susceptible to getting scratched up. Also, and I show this in the video review, but it might make more sense to reverse the display bracket to provide a wider degree of articulation. The standard configuration is a bit limiting and the display can only angle towards me about 10º. 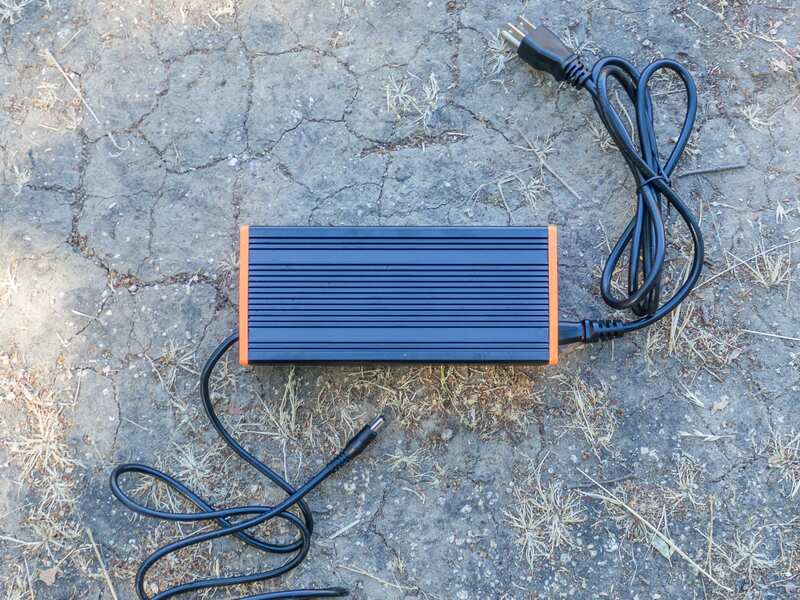 The charger for the Ultra is a 5 amp charger with a built-in fan to help dissipate the heat. 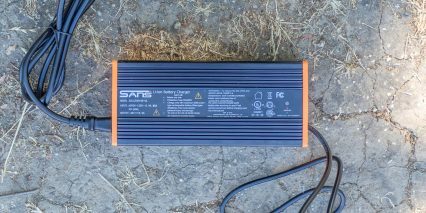 A 5 amp output is quite a bit higher than the average 2 amp output and should help to get the battery charged up considerably quicker. Getting the Ultra up and running is pretty straightforward. With the battery inserted, a long press of the power button on the independent button pad will bring it life. There’s a quick boot up sequence on the display and a few moments later it shows the home screen. Holding the light icon toggles the headlight and backlight, holding + switches between Eco and Sport mode, holding – activates walk mode, tapping + or – switches pedal assist modes, pressing the info button switches between display options like average speed and max speed, and double tapping the info button enters into the settings menu. The independent button pad itself is nice with easily depressible buttons that have tactile feedback, making me more confident that I actually switched pedal assist levels without needing to verify it on the display, which can be dangerous at higher speeds. However, the + and – buttons on the button pad feel like they could easily get snagged by a long sleeve shirt, a jacket cuff or even a fingernail and get torn off. One thing I especially appreciate about the electronics is that the throttle is live whenever the bike is turned on. 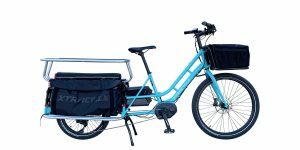 This is a great point for me as I like to use the throttle to zip across crosswalks and assist me up stairs, especially with a bike like this that weighs 75 pounds. The headlight on the Ultra is a Spanninga Kendo+, which helps to increase visibility but doesn’t do a whole lot in the way of providing illumination for night riding. The beam pattern here is just too unfocused. There also isn’t a taillight, and with the darker frame colors overall visibility isn’t going to be super high at night, so it might be a good idea to check out some aftermarket headlights, taillights, helmets with lights in them, etc for those like me who love to ride at night. It’s just so peaceful am I right? 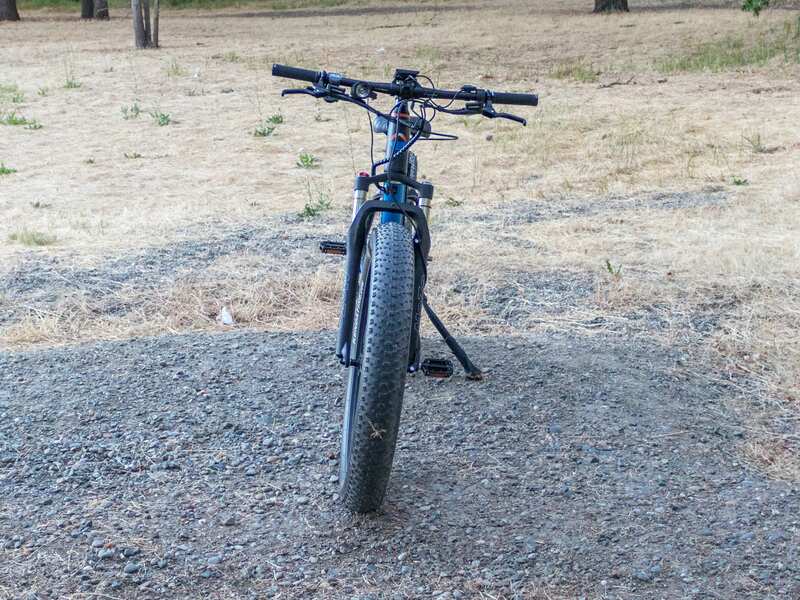 Overall, this bike is not only fun to ride thanks to the powerful 750-watt mid-drive motor, but it’s also comfortable thanks to the Selle Royal Lookin gel saddle, full suspension and fat four-inch tires with their massive air volume. 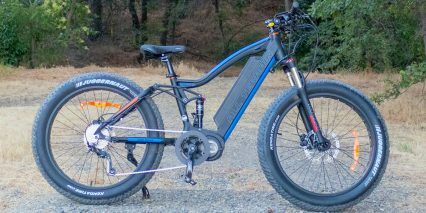 The Ultra feels like it’s a truly off-road capable electric bike, but it’s weight probably doesn’t lend itself well to extreme downhill riding. The weight also makes the bike FEEL heavy while riding. It takes some oomph to handle this bike and it’s not particularly easy to throw around. There are two frame sizes, but that’s still a bit limiting compared to the four different frame sizes of the R750. 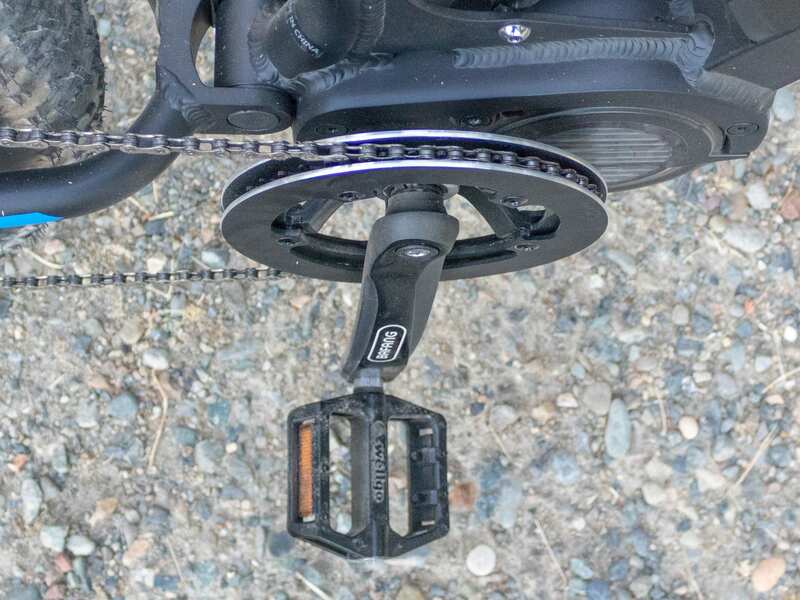 On the other hand, the Ultra does have some nice components like the Shimano Alivio derailleur, MOZO air suspension with 120 mm of travel and a DNM air suspension in the rear. Not to mention the fact it has hydraulic brakes with that massive 203 mm rotor in the front, motor inhibitors and shift detection. 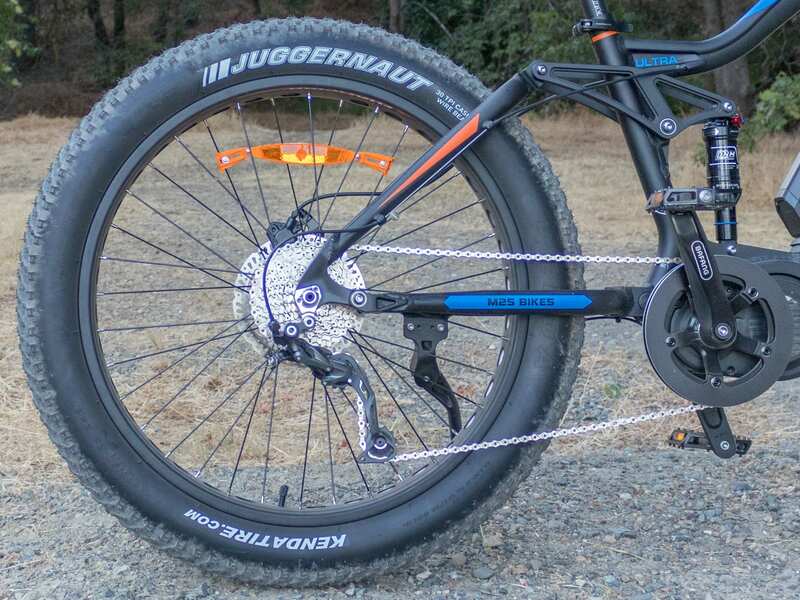 There’s a lot to this bike and it feels like it would do well off-road, especially on soggy terrain like snow, mud, sand, gravel, etc because of the fat tires. 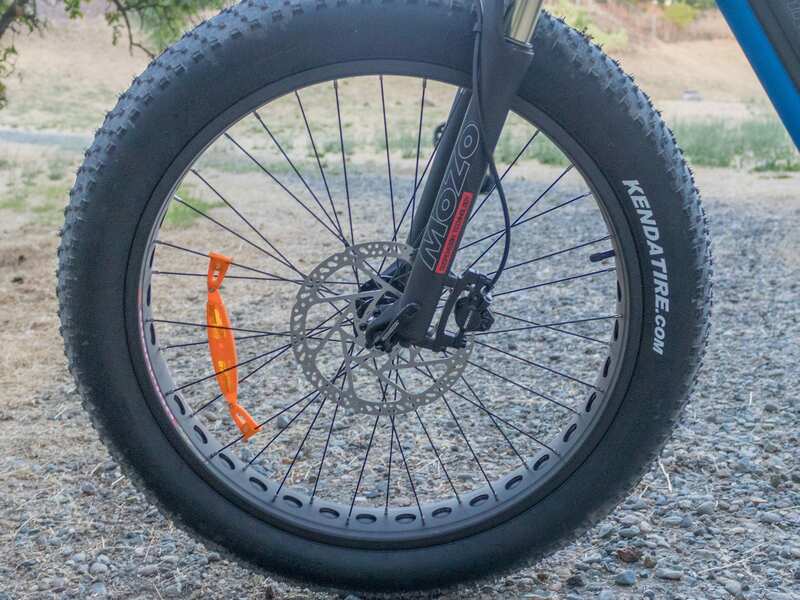 However, those same fat tires that excel off-road don’t perform so great on pavement, with a fair amount of rolling resistance, high centrifugal force and tire noise. 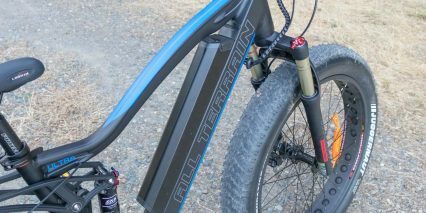 The Ultra also doesn’t have bottle cage bosses or fender bosses, which might leave me a little dirtier than I’d prefer when riding on the streets in my normal clothes. Still, for streets that have plenty of pot holes or aren’t freshly finished, this might still be a good option. This bike might also be great for riders like me who have shorter inseams since the top tube swoops down to provide a lower stand over height. The high top speed is awesome and quite fun, but I do want to caution again that the class 3 configuration won’t be legal in all areas. I want to thank M2S for partnering with me on this review and if you have any questions please leave them here, on YouTube or in the forums and Court and I will respond as quickly as possible! If you’re going out to ride, have fun and ride safe! Hi Brent & Court: Your reviews are great. 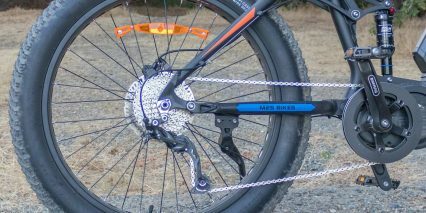 Any chance of doing a review on the M2S Kush 750 rear hub motor full suspension bike. Thanks for the kind words, man. I’m working with M2S to try to get as many reviews done as possible, and hopefully that will include the Kush! Thanks for the quick reply Brent. I look forward to your comprehensive reviews. Hi Mark! This is Court… I’m going to speak on behalf of Brent because I don’t think that he still has the demo bike and I believe that he was incorrect about the shocks being air. 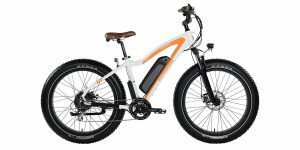 I believe that they are spring shocks based on the photos and have double checked the official M2S website which says “Mozo hydraulic dampened fork with rebound adjust and lockout”. This may be why we don’t see air valve covers. I apologize for the mistake and have updated the specs here to reflect what we’ve learned. Hi Court, thanks for the quick reply but we may not be talking about the same bike. 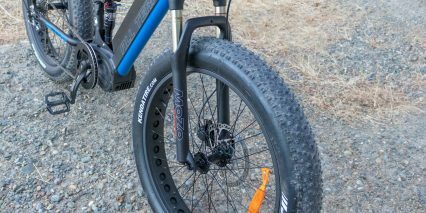 The one I am talking about is the All Terrain Ultra Bafang Ultra Fat Bike. 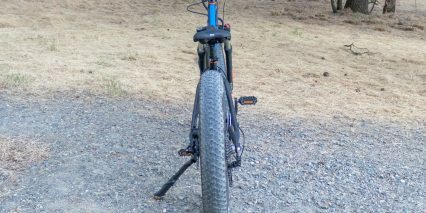 The spec I see on their site says” Front Fork: Mozo Air Suspension and Rear Shock: DNM air shock with lockout.” That is why I wondered why we did not see an air valve on the front shock in Brents demo. Hi again Court. 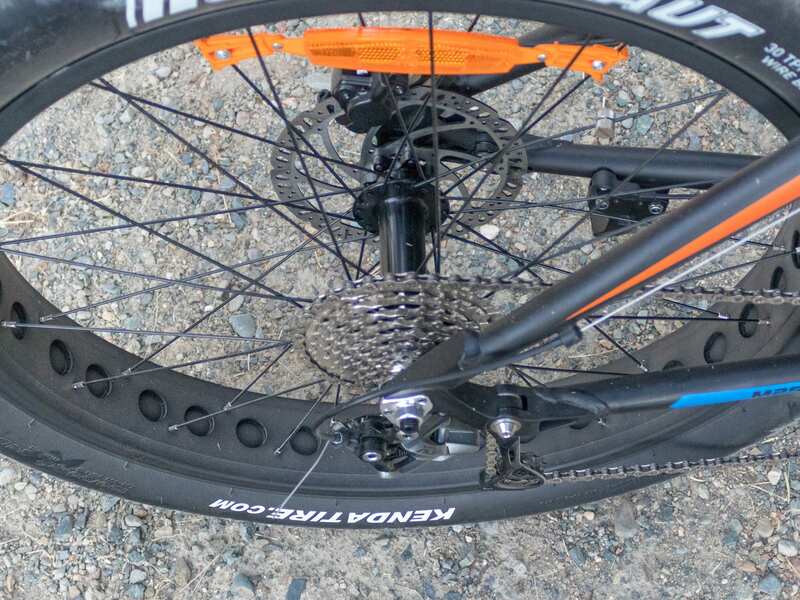 I emailed Eric at M2S about that and he reminded me (and Brent did mention it in the review) that he thought that bike had arrived to you with a broken fork and they sent a new one which may have been a regular spring fork. He said that bike does come with an air fork.